Chest radiographs in a premature infant with respiratory distress syndrome before and after surfactant treatment. Left: Initial radiograph shows poor lung expansion, air bronchogram, and reticular granular appearance. 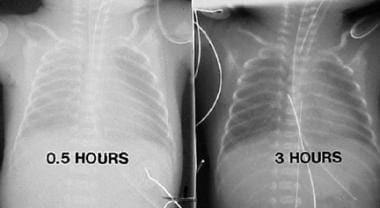 Right: Repeat chest radiograph obtained when the neonate is aged 3 hours and after surfactant therapy demonstrates marked improvement. Schematic outlines the pathology of respiratory distress syndrome (RDS). Infants may recover completely or develop chronic lung damage, resulting in bronchopulmonary dysplasia (BPD). 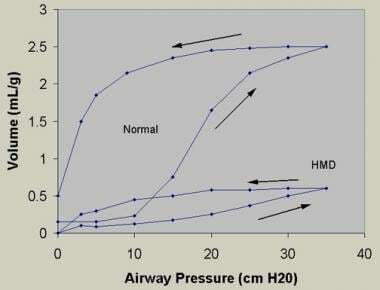 FiO2 = fraction of inspired oxygen; HMD = hyaline membrane disease; V/Q = ventilation perfusion. Surfactant is a complex lipoprotein (see the image below) composed of 6 phospholipids and 4 apoproteins. Surfactant recovered by alveolar wash from most mammals contains 70-80% phospholipids, 8-10% protein, and 10% neutral lipids, primarily cholesterol. Dipalmitoyl phosphatidylcholine (DPPC), or lecithin, is functionally the principle phospholipid. Phosphatidylglycerol makes up 4-15% of the phospholipids; although it is a marker for lung maturity, it is not necessary for normal lung function. 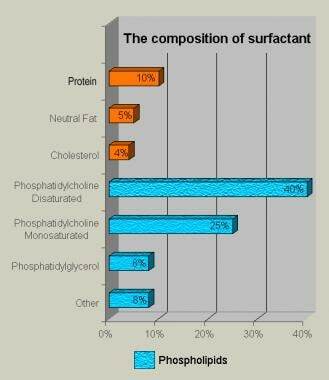 Bar chart demonstrates the composition of lung surfactant. About 1% of the 10% protein component comprises surfactant apoproteins; the remaining proteins are derived from alveolar exudate. Among the 4 surfactant apoproteins identified, surfactant protein B (SP-B) and SP-C are 2 small hydrophobic proteins that make up 2-4% of the surfactant mass and are present in commercially available surfactant preparations. SP-B and SP-C work in concert to facilitate rapid adsorption and spreading of DPPC as a monolayer to lower the surface tension at the alveolar air-fluid interface in vivo during expiration, thus preventing atelectasis. The SP-B gene is on human chromosome 2, and its primary translation product is 40 kd, which is clipped to become an 8-kd protein in the type II cells before entering lamellar bodies to be cosecreted with phospholipids. The SP-C gene is on chromosome 8; its primary translation product, 22 kd, is processed to an extremely hydrophobic 4-kd protein that is associated with lipids in lamellar bodies. SP-A is an innate host defense, large molecular, hydrophilic (water soluble) lectin coded on human chromosome 10 that regulates lung inflammation. SP-A contributes to the biophysical properties of surfactant primarily by decreasing protein-mediated inhibition of surfactant function. It binds to multiple organisms, such as group B streptococcus, Staphylococcus aureus, influenza virus, adenovirus, herpes simplex type 1, and respiratory syncytial virus. SP-A facilitates phagocytosis of pathogens by macrophages and their clearance from the airways. Mice that lack SP-A have no tubular myelin and have normal lung function and surfactant metabolism, indicating that SP-A is not a critical regulator of surfactant metabolism. Patients with SP-A deficiency have not been described. SP-D is also a hydrophilic protein of 43 kd that is a collectin with structural similarities to SP-A. It has a collagenlike domain and a glycosylated region that gives it its lectinlike functions. SP-D is a large multimer that is synthesized by type II alveolar cells and Clara cells in addition to other epithelial cells in the body. It also binds pathogens and facilitates their clearance. The absence of SP-D results in increased surfactant lipid pools in the airspaces and emphysema in mice. No humans with SP-D deficiency have been described. Schematic show surfactant metabolism, with a single alveolus is shown and the location and movement of surfactant components. Surfactant components are synthesized from precursors in the endoplasmic reticulum and transported through the Golgi apparatus by multivesicular bodies. Components are ultimately packaged in lamellar bodies, which are intracellular storage granules for surfactant before its secretion. After secretion (exocytosis) into the liquid lining of the alveolus, surfactant phospholipids are organized into a complex lattice called tubular myelin. Tubular myelin is believed to generate the phospholipid that provides material for a monolayer at the air-liquid interface in the alveolus, which lowers surface tension. Surfactant phospholipids and proteins are subsequently taken back into type II cells, in the form of small vesicles, apparently by a specific pathway that involves endosomes, and then are transported for storage into lamellar bodies for recycling. 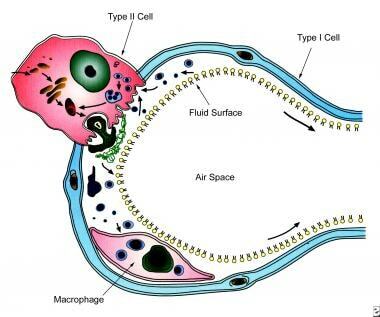 Alveolar macrophages also take up some surfactant in the liquid layer. A single transit of the phospholipid components of surfactant through the alveolar lumen normally requires a few hours. The phospholipid in the lumen is taken back into type II cell and is reused 10 times before being degraded. Surfactant proteins are synthesized in polyribosomes and extensively modified in the endoplasmic reticulum, Golgi apparatus, and multivesicular bodies. Surfactant proteins are detected in lamellar bodies or secretory vesicles closely associated with lamellar bodies before they are secreted into the alveolus. The components are packaged in multilamellar vesicles in the cytoplasm of the type II alveolar cell. They are secreted by a process of exocytosis, the daily rate of which may exceed the weight of the cell. Once secreted, the vesicles unwind to form bipolar monolayers of phospholipid molecules that depend on the apoproteins SP-B and SP-C to properly configure in the alveolus. The lipid molecules are enriched in dipalmitoyl acyl groups attached to a glycerol backbone that pack tightly and generate low surface tension. Tubular myelin stores surfactant and depends on SP-B. Corners of the myelin lattice appear to be glued together with the large apoprotein SP-A, which may also have an important role in phagocytosis. Surfactant proteins are expressed in the fetal lung with increasing gestational age. Because the risk of prematurity and respiratory distress syndrome is increased for subsequent pregnancies, counsel the parents. Education and counseling of parents, caregivers, and families of premature infants must be undertaken as part of discharge planning. These individuals should be advised of the potential problems infants with respiratory distress syndrome may encounter during and after their nursery stay. Audiovisual aids and handouts supplement such education. In premature infants, respiratory distress syndrome develops because of impaired surfactant synthesis and secretion leading to atelectasis, ventilation-perfusion (V/Q) inequality, and hypoventilation with resultant hypoxemia and hypercarbia. Blood gases show respiratory and metabolic acidosis that cause pulmonary vasoconstriction, resulting in impaired endothelial and epithelial integrity with leakage of proteinaceous exudate and formation of hyaline membranes (hence the name). The relative deficiency of surfactant decreases lung compliance (see the image below) and functional residual capacity, with increased dead space. The resulting large V/Q mismatch and right-to-left shunt may involve as much as 80% of the cardiac output. Bottom curve reflects findings from lungs obtained at postmortem from an infant with hyaline membrane disease (HMD). Lungs with HMD require far more pressure than to achieve a given volume of inflation than do lungs obtained from an infant dying of a nonrespiratory cause. Arrows indicate inspiratory and expiratory limbs of the pressure-volume curves. Note the decreased lung compliance and increased critical opening and closing pressures, respectively, in the premature infant with HMD. Hypoxia, acidosis, hypothermia, and hypotension may impair surfactant production and/or secretion. In many neonates, oxygen toxicity with barotrauma and volutrauma in their structurally immature lungs causes an influx of inflammatory cell, which exacerbates the vascular injury, leading to bronchopulmonary dysplasia (BPD). Antioxidant deficiency and free-radical injury worsen the injury. Upon macroscopic evaluation, the lungs of affected newborns appear airless and ruddy (ie, liverlike). Therefore, the lungs require an increased critical opening pressure to inflate. Diffuse atelectasis of distal airspaces along with distension of distal airways and perilymphatic areas are observed microscopically. Progressive atelectasis, barotrauma or volutrauma, and oxygen toxicity damage endothelial and epithelial cells lining these distal airways, resulting in exudation of fibrinous matrix derived from blood. Hyaline membranes that line the alveoli (see the image below) may form within a half hour after birth. In larger premature infants, the epithelium begins to heal at 36-72 hours after birth, and endogenous surfactant synthesis begins. The recovery phase is characterized by regeneration of alveolar cells, including type II cells, with a resultant increase in surfactant activity. The healing process is complex. Microscopic appearance of lungs of an infant with respiratory distress syndrome. Hematoxylin and eosin stain shows hyaline membranes (pink areas). A chronic process often ensues in infants who are extremely immature and critically ill and in infants born to mothers with chorioamnionitis, resulting in BPD. In extremely premature infants, an arrest in lung development often occurs during the saccular stage, resulting in chronic lung disease termed "new" BPD. SP-B deficiency is an inherited deficiency caused by a pretranslational mechanism implied by the absence of messenger ribonucleic acid (mRNA). 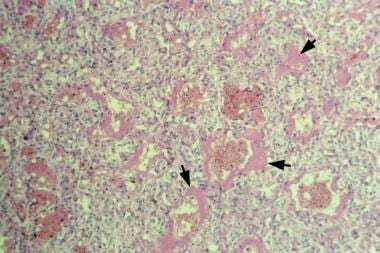 SP-B deficiency leads to death in term or near-term neonates and clinically manifests as respiratory distress syndrome with pulmonary hypertension, or congenital alveolar proteinosis. The genetic absence of SP-B is most often caused by a 2-base pair insertion (121 ins 2) that produces a frame shift and premature terminal signal, resulting in a complete absence of SP-B. Approximately 15% of term infants who die of a syndrome similar to respiratory distress syndrome have SP-B deficiency. The lack of SP-B causes a lack of normal lamellar bodies in type II cells, a lack of SP-C, and the appearance of incompletely processed SP-C in the airspaces. These pro SP-C forms are diagnostic of SP-B deficiency. Analysis of lung tissue with immunologic and biologic methods reveals an absence of one of the surfactant specific proteins, SP-B, and its mRNA. In an in-vitro study, critical structure and function in the N-terminal region of pulmonary SP-B was noted. W9 is critical to optimal surface activity, whereas prolines may promote a conformation that facilitates rapid insertion of the peptide into phospholipid monolayers compressed to the highest pressures during compression-expansion cycling. Mutations of SP-B and SP-C cause acute respiratory distress syndrome and chronic lung disease that may be related to the intracellular accumulation of injurious proteins, extracellular deficiency of bioactive surfactant peptides, or both. Mutations in the gene for SP-C are a cause of familial and sporadic interstitial lung disease and emphysema as patients age. Mutations in other genes that cause protein misfolding and misrouting may contribute to the pathogenesis of chronic interstitial lung disease. Hydrophilic SP-A and SP-D are lectins. In vivo and in vitro studies provide compelling support for SP-A and SP-D as mediators of various immune-cell functions. Studies have shown novel roles for these proteins in the clearance of apoptotic cells, direct killing of microorganisms, and initiation of parturition. None of the currently available surfactant preparations to treat respiratory distress syndrome have SP-A and SP-D. The incidence of genetic abnormalities of pulmonary surfactant disorders is unknown. In a review of 300 term infants presenting as severe respiratory distress syndrome, 14% had SP-B deficiency and 14% had a deficiency of ABCA3. In the United States, respiratory distress syndrome has been estimated to occur in 20,000-30,000 newborn infants each year and is a complication in about 1% pregnancies. Approximately 50% of the neonates born at 26-28 weeks' gestation develop respiratory distress syndrome, whereas less than 30% of premature neonates born at 30-31 weeks' gestation develop the condition. Respiratory distress syndrome is encountered less frequently in developing countries than elsewhere, primarily because most premature infants who are small for their gestation are stressed in utero because of malnutrition or pregnancy-induced hypertension. In addition, because most deliveries in developing countries occur at home, accurate records in these regions are unavailable to determine the frequency of respiratory distress syndrome. Respiratory distress syndrome has been reported in all races worldwide, occurring most often in white premature infants. Suspect an air leak (eg, pneumomediastinum, pneumopericardium, interstitial emphysema, pneumothorax) when an infant with respiratory distress syndrome suddenly deteriorates with hypotension, apnea, or bradycardia or when metabolic acidosis is persistent. Infections may complicate the management of respiratory distress syndrome and may manifest in various ways, including failure to improve, sudden deterioration, or a change in white blood cell (WBC) count or thrombocytopenia. Also, invasive procedures (eg, venipuncture, catheter insertion, use of respiratory equipment) and use of postnatal steroids provide access for organisms that may invade the immunologically compromised host. Intraventricular hemorrhage is observed in 20-40% of premature infants, with greater frequency in infants with respiratory distress syndrome who require mechanical ventilation. Cranial ultrasonography is performed in the first week in premature neonates younger than 32 weeks' gestation and at 36 weeks or at the time of discharge, or as indicated (eg, suspected seizures). Use of antenatal steroids has decreased the frequency of intracranial hemorrhage in these patients with respiratory distress syndrome. Although a few studies have shown that prophylactic indomethacin therapy may decrease intraventricular hemorrhage in premature infants, its routine use is discouraged because of the risk of intestinal perforation. Hypocarbia and chorioamnionitis are associated with an increase in periventricular leukomalacia. This shunt may complicate the course of respiratory distress syndrome, especially in infants weaned rapidly after surfactant therapy. Suspect patent ductus arteriosus (PDA) in any infant who deteriorates after initial improvement or who has bloody tracheal secretions. Although helpful in the diagnosis of PDA, cardiac murmur and wide pulse pressure are not always apparent in critically ill infants. An echocardiogram enables the clinician to confirm the diagnosis. Infants requiring low fraction of inspired oxygen (FIO2) or who are clinically stable do not require treatment, as the PDA may close spontaneously. Ductal-dependant cardiac anomalies should be excluded prior to initiating therapy. Treat PDA with ibuprofen or indomethacin, which can be repeated during the first 2 weeks if the PDA reopens. In refractory incidents of respiratory distress syndrome or in infants in whom medical therapy is contraindicated, surgically close the PDA. The occurrence of pulmonary hemorrhage increases in tiny premature infants, especially after surfactant therapy. Increase positive end-expiratory pressure (PEEP) on the ventilator and administer intratracheal epinephrine to manage pulmonary hemorrhage. In some patients, pulmonary hemorrhage may be associated with PDA; promptly treat pulmonary hemorrhage in such individuals. In a retrospective study, intratracheal surfactant therapy was used successfully, with the rationale that blood inhibits pulmonary surfactant. Suspect NEC and/or GI perforation in any infant with abnormal abdominal findings on physical examination. Radiography of the abdomen assists in confirming their presence. Spontaneous perforation (not necessarily as part of NEC) occasionally occurs in critically ill premature infants and has been associated with the use of steroids and/or indomethacin. Apnea of prematurity is common in immature infants, and its incidence has increased with surfactant therapy, possibly because of early extubation. Manage apnea of prematurity with methylxanthines (caffeine) and/or bubble or continuous flow nasal continuous positive airway pressure (CPAP), nasal intermittent ventilation, or with assisted ventilation in refractory incidents. Exclude septicemia, seizures, gastroesophageal reflux, and metabolic and other causes in infants with apnea of prematurity. BPD is a chronic lung disease defined as a requirement for oxygen at a corrected gestational age of 36 weeks. BPD is related directly to the high volume and/or pressures used for mechanical ventilation or to manage infections, inflammation, and vitamin A deficiency. BPD increases with decreasing gestational age. Clinical studies have demonstrated various incidences of BPD, which has been attributed to increased survival of small and ill infants with respiratory distress syndrome. BPD may also be associated with gastroesophageal reflux or sudden infant death syndrome. Hence, consider these entities in infants with unexplained apnea before discharging them from the hospital. Infants with respiratory distress syndrome who have a partial pressure of oxygen (PaO2) value of over 100mm Hg are at increased risk for ROP. Hence, closely monitor PaO2 and maintain it at 50-70mm Hg. Although pulse oximetry is used in all premature infants, it is not helpful in preventing ROP in tiny infants because of the flat portion of the oxygen-hemoglobin dissociation curve. An ophthalmologist examines the eyes of all premature infants at 34 weeks' gestation and thereafter as indicated. If ROP progresses, laser therapy or cryotherapy is used to prevent retinal detachment and blindness. Closely monitor infants with ROP for refractive errors. Neurologic impairment occurs in approximately 10-70% of infants and is related to the infant's gestational age, the extent and type of intracranial pathology, and the presence of hypoxia and infections. Hearing and visual handicaps may further compromise development in affected infants. Patients may develop a specific learning disability and aberrant behavior. Therefore, periodically follow up on these infants to detect those with neurologic impairment, and undertake appropriate interventions. Serrano AG, Ryan M, Weaver TE, et al. Critical structure-function determinants within the N-terminal region of pulmonary surfactant protein SP-B. Biophys J. 2006 Jan 1. 90(1):238-49. [Medline]. Shulenin S, Nogee LM, Annilo T, et al. ABCA3 gene mutations in newborns with fatal surfactant deficiency. N Engl J Med. 2004 Mar 25. 350(13):1296-303. [Medline]. Gerten KA, Coonrod DV, Bay RC, et al. Cesarean delivery and respiratory distress syndrome: does labor make a difference?. Am J Obstet Gynecol. 2005 Sep. 193(3 Pt 2):1061-4. [Medline]. Qiu X, Lee SK, Tan K, et al. Comparison of Singleton and Multiple-Birth Outcomes of Infants Born at or Before 32 Weeks Gestation. Obstetrics and Gynecology. February 2008. 111:365-371. [Medline]. Hintz SR, Van Meurs KP, Perritt R, et al. Neurodevelopmental Outcomes of Premature Infants with Severe Respiratory Failure Enrolled in a Randomized Controlled Trial of Inhaled Nitric Oxide. Journal of Pediatrics. July 2007. 151:e1-3. [Medline]. Fanaroff AA, Stoll BJ, Wright LL, et al. Trends in Neonatal Morbidity and Mortality for Very Low Birthweight Infants. American Journal of Obstetrics and Gynecology. February 2007. 147:e1-e8. [Medline]. Kaufman D, Boyle R, Hazen KC, Patrie JT, Robinson M, Donowitz LG. Fluconazole prophylaxis against fungal colonization and infection in preterm infants. N Engl J Med. 2001 Dec 6. 345(23):1660-6. [Medline]. Ohlsson A, Walia R, Shah S. Ibuprofen for the treatment of patent ductus arteriosus in preterm and/or low birth weight infants. Cochrance Database Syst Rev. Jan 2008. 23:CD003481. [Medline]. Su PH, Chen JY. Inhaled Nitric Oxide in the Management of Preterm Infants with Severe Respiratory Failure. Journal of Perinatology. February 2008. 28:112-116. [Medline]. Darlow BA, Ells AL, Gilbert CE, Gole GA, Quinn GE. Are we there yet? Bevacizumab therapy for retinopathy of prematurity. Arch Dis Child Fetal Neonatal Ed. 2011 Dec 30. [Medline]. Sun H, Zhou Y, Xiong H, et al. Prognosis of Very Preterm Infants with Severe Respiratory Distress Syndrome Receiving Mechanical Ventilation. Lung. 2015 Jan 13. [Medline]. Billman GF, Hughes AB, Dudell GG, et al. Clinical performance of an in-line, ex vivo point-of-care monitor: a multicenter study. Clin Chem. 2002 Nov. 48(11):2030-43. [Medline]. Gupta S, Sinha S, Tin W, et al. A randomized controlled trial of post-extubation bubble continuous positive airway pressure versus Infant Flow Driver continuous positive airway pressure in preterm infants with respiratory distress syndrome. Journal of Pediatrics. May 2009. 154:645-650. [Medline]. De Paoli AG, Davis PG, Faber B, Morley CJ. Devices and Pressure Sources for Administration of Nasal Continuous Positive Airway Pressure (NCPAP) in Preterm Neonates (Review). The Cochrane Collaboration. [Medline]. Patry C, Hien S, Demirakca S, et al. Adjunctive Therapies for Treatment of Severe Respiratory Failure in Newborns. Klin Padiatr. 2015 Jan. 227(1):28-32. [Medline]. Crowther CA, Haslam RR, Hiller JE, et al. Neonatal respiratory distress syndrome after repeat exposure to antenatal corticosteroids: a randomised controlled trial. Lancet. June 2006. 367:1913-1919. [Medline]. Doyle LW, Davis PG, Morley CJ, et al. Outcome at 2 Years of Age of Infants from the DART Study: A Multicenter, International, Randomized, Controlled Trial of Low-Dose Dexamethasonef. Pediatrics. April 2007. 119:716-721. [Medline]. Lin YJ, Lin CH, Wu JM, et al. The effects of early postnatal dexamethasone therapy on pulmonary outcome in premature infants with respiratory distress syndrome: a two-year follow-up study. Acta Paediatr. 2005 Mar. 94(3):310-6. [Medline]. Peaceman AM, Bajaj K, Kumar P, et al. The interval between a single course of antenatal steroids and delivery and its association with neonatal outcomes. Am J Obstet Gynecol. 2005 Sep. 193(3 Pt 2):1165-9. [Medline]. Pesonen AK, Raikkonen K, Lano A, et al. Antenatal betamethasone and fetal growth in prematurely born children: implications for temperament traits at the age of 2 years. Pediatrics. 2009 Jan. 123(1):e31-7. [Medline]. Ring AM, Garland JS, Stafeil BR, et al. The effect of a prolonged time interval between antenatal corticosteroid administration and delivery on outcomes in preterm neonates: a cohort study. Am J Obstet Gynecol. May 2007. 196:1-6. [Medline]. Roberts D, Dalziel S. Antenatal corticosteroids for accelerating fetal lung maturation for women at risk of preterm birth. Cochrane Database Syst Rev. July 2006. 3:CD004454. [Medline]. Wapner RJ, Sorokin Y, Thom EA, et al. Single versus weekly courses of antenatal corticosteroids: evaluation of safety and efficacy. Am J Obstet Gynecol. 2006. 195:633-642. [Medline]. Murphy KE, Hannah ME, Willan AR, et al. Multiple courses of antenatal corticosteroids for preterm birth (MACS): a randomised controlled trial. Lancet. Dec 2008. 372:2143-2151. [Medline]. Porto AM, Coutinho IC, Correia JB, Amorim MM. Effectiveness of antenatal corticosteroids in reducing respiratory disorders in late preterm infants: randomised clinical trial. BMJ. 2011 Apr 12. 342:d1696. [Medline]. [Full Text]. Wapner RJ, Sorokin Y, Mele L, et al. Long-term outcomes after repeat doses of antenatal corticosteroids. New England Journal of Medicine. 2007. 357:1190-1198. [Medline]. Crowther CA, Doyle LW, Haslam RR, et al. Outcomes at 2 years of age after repeat doses of antenatal corticosteroids. N Engl J Med. 2007. 357:1179-1189. [Medline]. Carlo WA, McDonald SA, Fanaroff AA, et al. Association of antenatal corticosteroids with mortality and neurodevelopmental outcomes among infants born at 22 to 25 weeks' gestation. JAMA. 2011 Dec 7. 306(21):2348-58. [Medline]. Engle WA, The Committee on Fetus and Newborn. Surfactant-Replacement Therapy for Respiratory Distress in the Preterm and Term Neonate. Pediatrics. February 2008. 212:419-432. [Medline]. Katz LA, Klein JM. Repeat Surfactant Therapy fro Postsurfactant Slump. Journal of Perinatology. May 2006. 26:414-422. [Medline]. Rojas MA, Lozano JM, Rojas MX, Laughon M, Bose CL, Rondon MA, et al. Very early surfactant without mandatory ventilation in premature infants treated with early continuous positive airway pressure: a randomized, controlled trial. Pediatrics. 2009 Jan. 123(1):137-42. [Medline]. Turker G, Koksal N. Complement 4 levels as early predictors of poor response to surfactant therapy in respiratory distress syndrome. Am J Perinatol. 2005 Apr. 22(3):149-54. [Medline]. Fuchs H, Lindner W, Leiprecht A, Mendler MR, Hummler HD. Predictors of early nasal CPAP failure and effects of various intubation criteria on the rate of mechanical ventilation in preterm infants of Arch Dis Child Fetal Neonatal Ed</i>. 2011 Sep. 96(5):F343-7. [Medline]. Stevens TP, Blennow M, Soll RF. Early surfactant administration with brief ventilation vs selective surfactant and continued mechanical ventilation for preterm infants with or at risk for respiratory distress syndrome. Cochrane Database Syst Rev. 2004. CD003063. [Medline]. Reininger A, Khalak R, Kendig JW, et al. Surfactant administration by transient intubation in infants 29 to 35 weeks' gestation with respiratory distress syndrome decreases the likelihood of later mechanical ventilation: a randomized controlled trial. J Perinatol. 2005 Nov. 25(11):703-8. [Medline]. Kahn DJ, Courtney SE, Steele AM, Habib RH. Unpredictability of delivered bubble nasal continuous positive airway pressure: role of bias flow magnitude and nares-prong air leaks. Pediatr Res. Sept 2007. 62:343-347. [Medline]. Notter RH. Lung surfactants: Basic science and clinical applications. Lung Biology in Health and Disease. 2000. Vol 149: 7-344. Kresch MJ, Lin WH, Thrall RS. Surfactant replacement therapy. Thorax. 1996 Nov. 51(11):1137-54. [Medline]. Laughon M, Bose C, Moya F, et al. A Pilot Randomized, Controlled Trial of Later Treatment With a Peptide-Containing, Synthetic Surfactant for the Prevention of Bronchopulmonary Dysplasia. Pediatrics. 2009. 123:89-96. [Medline]. Malloy CA, Nicoski P, Muraskas JK. A randomized trial comparing beractant and poractant treatment in neonatal respiratory distress syndrome. Acta Paediatr. 2005 Jun. 94(6):779-84. [Medline]. Moya F, Maturana A. Animal-Derived Surfactants Versus Past and Current Synthetic Surfactants: Current Status. Clinics in Perinatoloty. 2007. 34:145-177. [Medline]. Moya F, Sinha S, Gadzinowski J, et al. One-Year Follow-up of Very Preterm Infants who Received Lucinactant for Prevention of Respiratory Distress Syndrome: Results From 2 Multicenter Randomized, Controlled Trials. Pediatrics. June 2007. 119:e1361-e1370. [Medline]. Pfister RH, Soll R, Wiswell TE. Protein Containing Synthetic Surfactant Versus Animal-Derived Surfactant Extract for the Prevention and Treatment of Respiratory Distress Syndrome (Review). The Cochrance Collaboration. October 2007. 4:[Medline]. Sinha SK, Lacaze-Masmonteil T, Valls i Soler A, et al. A Multicenter, Randomized, Controlled Trial of Lucinactant Versus Poractant Alfa Among Very Premature Infants at High Risk for Respiratory Distress Syndrome. Pediatrics. April 2005. 115:1030-1038. [Medline]. Moya FR, Gadzinowski J, Bancalari E, Salinas V, Kopelman B, Bancalari A. A multicenter, randomized, masked, comparison trial of lucinactant, colfosceril palmitate, and beractant for the prevention of respiratory distress syndrome among very preterm infants. Pediatrics. 2005 Apr. 115(4):1018-29. [Medline]. Kinniry P, Pick J, Stephens S, et al. KL4-Surfactant Prevents Hyperoxic and LPS-Induced Lung Injury in Mice. Pediatric Pulmonology. October 2006. 41:916-928. [Medline]. Gregory GA, Kitterman JA, Phibbs RH, et al. Treatment of the idiopathic respiratory-distress syndrome with continuous positive airway pressure. N Engl J Med. 1971 Jun 17. 284(24):1333-40. [Medline]. Ammari A, Suri M, Milisavljevic V, et al. Variables associated with the early failure of nasal CPAP in very low birth weight infants. J Pediatr. 2005 Sep. 147(3):341-7. [Medline]. Murray PG, Stewart MJ. Use of Nasal Continuous Positive Airway Pressure During Retrieval of Neonates With Acute Respiratory Distress. Pediatrics. March 2008. 121:e754-e758. [Medline]. Wells DA, Gillies D, Fitzgerald DA. Positioning for acute respiratory distress in hospitalised infants and children. Cochrane Database Syst Rev. 2005. CD003645. [Medline]. Stack JA, Jalaludin B. Developmental Outcomes at the Age of Two Years for Very Premature Babies Managed with Nasal Prong Continuous Positive Airway Pressure. Journal of Paediatrics and Child Health. June 2007. 43:480-485. [Medline]. Subramaniam P, Henderson-Smart DJ, Davis PG. Prophylactic nasal continuous positive airways pressure for preventing morbidity and mortality in very preterm infants. Cochrane Database Syst Rev. July 2005. 20:CD001243. [Medline]. Booth C, Premkumar MH, Yannoulis A, et al. Sustainable use of continuous positive airway pressure in extremely preterm infants during the first week after delivery. Arch Dis Child Fetal Neonatal Ed. Nov 2006. 91:398-402. [Medline]. [Full Text]. Morley CJ, Davis PG, Doyle LW, et al. Nasal CPAP or intubation at birth for very preterm infants. New England Journal of Medicine. Feb 2008. 358:700-708. [Medline]. Narendran V, Donovan E, Hoath S, et al. Early Bubble CPAP and Outcomes in ELBW Preterm Infants. Journal of Perinatology. May 2003. 23:195-199. [Medline]. Lampland AL, Plumm B, Worwa C, Meyers P, Mammel MC. Bi-level CPAP does not improve gas exchange when compared with conventional CPAP for the treatment of neonates recovering from respiratory distress syndrome. Arch Dis Child Fetal Neonatal Ed. 2015 Jan. 100(1):F31-4. [Medline]. Armfield M, West G. Use of Vapotherm for respiratory support with neonates. Paediatr Nurs. 2009 Feb. 21(1):27-30. [Medline]. Holleman-Duray D, Kaupie D, Weiss MG. Heated humidified high-flow nasal cannula: use and a neonatal early extubation protocol. Journal of Perinatology. 2007. 27:776-781. [Medline]. Kirby R, Robison E, Schulz J, DeLemos RA. Continuous-flow ventilation as an alternative to assisted or controlled ventilation in infants. Anesth Analg. 1972 Nov-Dec. 51(6):871-5. [Medline]. D'Angio CT, Chess PR, Kovacs SJ, et al. Pressure-regulated volume control ventilation vs synchronized intermittent mandatory ventilation for very low-birth-weight infants: a randomized controlled trial. Arch Pediatr Adolesc Med. 2005 Sep. 159(9):868-75. [Medline]. Truffert P, Paris-Llado J, Escande B, et al. Neuromotor Outcome at 2 Years of Very Preterm Infants Who Were Treated with High-Frequency Oscillatory Ventilation or Conventional Ventilation for Neonatal Respiratory Distress Syndrome. Pediatrics. 2007. 119:e860-e865. [Medline]. Field D, Elbourne D, Truesdale A, et al. Neonatal Ventilation With Inhaled Nitric Oxide Versus Ventilatory Support Without Inhaled Nitric Oxide for Preterm Infants With Severe Respiratory Failure: the INNOVO multicentre randomised controlled trial. Pediatrics. April 2005. 115:926-936. [Medline]. Kinsella JP, Abman SH. Inhaled nitric oxide in the premature newborn. J Pediatr. 2007 Jul. 151(1):10-5. [Medline]. Schreiber MD, Marks JD. No definitive recommendation for iNO in preterm infants. J Pediatr. 2006 Jul. 149(1):146-7; author reply 147. [Medline]. Van Meurs KP, Hintz SR, Ehrenkranz RA, et al. Inhaled nitric oxide in infants >1500 g and J Perinatol</i>. 2007 Jun. 27(6):347-52. [Medline]. Ballard RA, Truog WE, Cnaan A, et al. Inhaled Nitric Oxide in Preterm Infants Undergoing Mechanical Ventilation. New England Journal of Medicine. July 2006. 355:343-353. [Medline]. Kinsella JP. 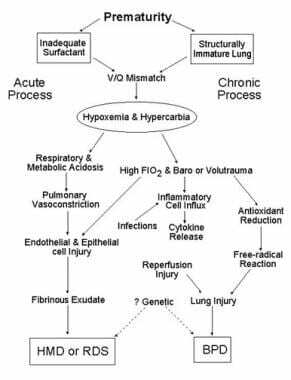 Inhaled nitric oxide in the term newborn. Early Hum Dev. 2008 Nov. 84(11):709-16. [Medline]. Ahmed SJ, Rich W, Finer NN. The effect of averaging time on oximetry values in the premature infant. Pediatrics. 2010 Jan. 125(1):e115-21. [Medline]. Claure N, Bancalari E, D'Ugard C, et al. Multicenter crossover study of automated control of inspired oxygen in ventilated preterm infants. Pediatrics. 2011 Jan. 127(1):e76-83. [Medline]. Courtney SE, Kahn DJ, Singh R, Habib RH. Bubble and ventilator-derived nasal continuous positive airway pressure in premature infants: work of breathing and gas exchange. J Perinatol. 2011 Jan. 31(1):44-50. [Medline]. Dumpa V, Northrup V, Bhandari V. Type and timing of ventilation in the first postnatal week is associated with bronchopulmonary dysplasia/death. Am J Perinatol. 2011 Apr. 28(4):321-30. [Medline]. Finer NN, Carlo WA, Walsh MC, et al. Early CPAP versus surfactant in extremely preterm infants. N Engl J Med. 2010 May 27. 362(21):1970-9. [Medline]. [Full Text]. Jatana KR, Oplatek A, Stein M, Phillips G, Kang DR, Elmaraghy CA. Effects of nasal continuous positive airway pressure and cannula use in the neonatal intensive care unit setting. Arch Otolaryngol Head Neck Surg. 2010 Mar. 136(3):287-91. [Medline]. Kugelman A, Feferkorn I, Riskin A, Chistyakov I, Kaufman B, Bader D. Nasal intermittent mandatory ventilation versus nasal continuous positive airway pressure for respiratory distress syndrome: a randomized, controlled, prospective study. J Pediatr. 2007 May. 150(5):521-6, 526.e1. [Medline]. Morley CJ, Davis PG, Doyle LW, Brion LP, Hascoet JM, Carlin JB. Nasal CPAP or intubation at birth for very preterm infants. N Engl J Med. 2008 Feb 14. 358(7):700-8. [Medline]. Singh J, Sinha SK, Alsop E, Gupta S, Mishra A, Donn SM. Long term follow-up of very low birthweight infants from a neonatal volume versus pressure mechanical ventilation trial. Arch Dis Child Fetal Neonatal Ed. 2009 Sep. 94(5):F360-2. [Medline]. Walsh MC, Hibbs AM, Martin CR, et al. Two-year neurodevelopmental outcomes of ventilated preterm infants treated with inhaled nitric oxide. J Pediatr. 2010 Apr. 156(4):556-61.e1. [Medline]. [Full Text]. Effects of early treatment with low-dose inhaled nitric oxide (iNO) on brain injury (ie, grade 3-4 intracranial hemorrhage [ICH], periventricular leukomalacia [PVL], ventriculomegaly) in premature infants according to birth weight strata. iNO reduced ultrasonography findings of brain injury for the overall group (n = 793), with the largest effect in the 750-g to 999-g group (n = 280). Control = □; iNO = ■. Effects of early treatment of preterm infants with low-dose inhaled nitric oxide (iNO) on bronchopulmonary dysplasia (BPD) incidence by birth weight strata. No difference in reduction was reported in infants weighing less than 1000 g (n = 129). Control = □; iNO = ■. Effects of inhaled nitric oxide (iNO) survival without bronchopulmonary dysplasia (BPD) for infants aged 7-21 days. iNO increased survival without BPD in infants who were treated before age 14 days (n = 727). Assisted ventilation newborn –Intubation and meconium aspiration. Video courtesy of Therese Canares, MD, and Jonathan Valente, MD, Rhode Island Hospital, Brown University.